In the now 25 year history of the Royal Rumble only 2 men have drawn number 1 and won the event. Shawn Michaels and Chris Benoit. Michaels did it in 1995 and went on to face Diesel at Wrestlemania 11. He came up short in his bid. Benoit did it in 2004. He went on to beat Michaels and Triple H in a Triple Threat match at Wrestlemania 20. It's not an easy accomplishment to outlast 29 other competitors. I guess for the sake of augment, you could throw Vince McMahon into this category too. He was the second man in the ring at the 1999 Rumble. Technically number two is in the match the same amount of time as number one. 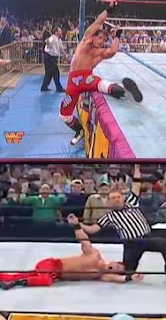 I know I probably shouldn't applaud the efforts by Chris Benoit, but I marked out when he eliminated the Big Show from the match and won the title shot. Two months later he and Eddie Guerrero celebrated in the ring at Madison Square Garden as both men were the two top champions in the company. It's sad neither is still here today. A heel Shawn Michaels tossed out the British Bulldog to pick up the first of his two Royal Rumble victories. It was a hard fought contest and many thought he'd been eliminated, including Davey Boy Smith who turned his back to celebrate. Shawn skinned the cat, one foot touched the floor, and he was back in the match. A double axe handle from behind was all she wrote for the Bulldog. Enjoy the highlights of both men's unique accomplishments.